Please Note: While admission to the Early French Immersion (SK entry)/Junior Extended French (Grade 4 entry) program is guaranteed at the entry points to all eligible on time applicants, admission to a specific school is not guaranteed if the school reaches capacity. Application to begin these programs is open to all students not already enrolled in an FSL program. 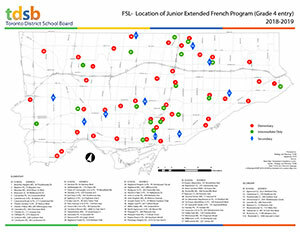 The maps below show the locations of Early French Immersion Program (SK entry) and Junior Extended French Program (Grade 4 entry) sites located across the TDSB. Please Note: While the maps below indicate schools housing French Immersion and Extended French programs, they may not have reached the full grade range in certain newly established sites. Please check directly with the school for information regarding the grade levels housed within that particular school.